The Nike Air Flightposite 2014 “Copper” gives a nod to the 90′s as the resurgence of sneakers from the decade continue to make their way in stores as reborn models. The Nike Air Flightposite was one of the sneakers that symbolized a change in tide for Nike Basketball footwear. It was an experiment in style and innovation that teeters the line between street and tech. To this day, its bold nature solidifies its spot in our minds. 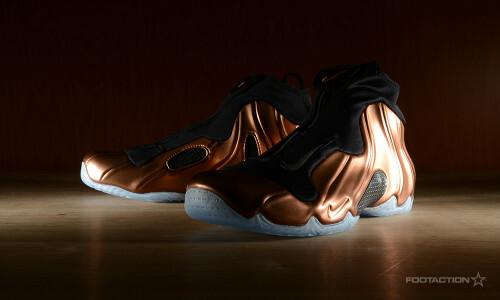 This Saturday, the Air Flightposite returns in a Copper and Black colorway that is certainly eye-catching. Cap it off with an icy blue outsole and you’ve got yourself another classic on the shelves. Print article This entry was posted by hhcblog on September 27, 2014 at 11:04 pm, and is filed under Footwear. Follow any responses to this post through RSS 2.0. You can leave a response or trackback from your own site.